Testimonials can be extremely effective in persuading prospects to choose your company’s products or services. One of the best ways to convert prospects into customers is with written testimonials. These third-party endorsements can carry a lot of weight in the mind of someone choosing between your product/service and your competition’s. Over the years I’ve had clients ask me how to go about getting testimonials. And recently one of my copywriter colleagues asked me the same. I’m publishing her questions and my replies because they may help others who are seeking testimonials for their business. I was looking at the testimonials on your website here, and I was so impressed, not just with the quantity of favorable comments but also the quality. Your clients pay you some wonderful compliments. It’s clear they love your work. Can I ask how you get your clients to offer testimonials? My clients are happy with my work, but I feel awkward asking them to put their positive feedback into writing. On the few occasions when I have asked, they’ve given me formal, stilted third person letters of recommendation, even if they’re very enthusiastic about my work. Do you have a method for getting such great words from your clients? To answer your question about testimonials, I used to ask clients for them and that resulted in straightforward letters of recommendation like the ones you described. They serve the purpose, which is why I do include them on my website, but as you noted, they’re a bit dull. That’s why these days I try to get short, spontaneous, enthusiastic testimonials. If a client says something nice about my copy in an email or even by phone, I save the comment. When the project is completely finished and the client seems satisfied, I send him a copy of their email or the comment stated by phone and ask his permission to use it. Sometimes I’ll edit together comments from multiple emails. And I won’t hesitate to fix a client’s English or smooth transitions, since I know the client will see and approve the statement before I post it on my site. 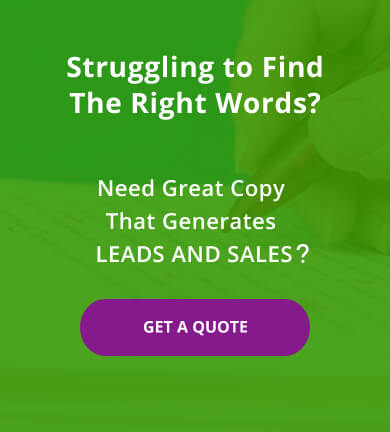 Only a few times has a client declined to let me publish their testimonial, and those were because they didn’t want competitors to know who they were using for copywriting their marketing materials. Now that we’ve completed your sales letter project, I have a favor to ask. In the email below, you were kind enough to make some flattering statements. Would it be alright if I edited together the lines noted in bold and used them as a testimonial with your name on my website here? That page helps me to grow my business. If you’d prefer to not be included, no problem. Just let me know. Please see the attached with a few comments embedded into the document. I am very pleased with the sales letter you wrote and think you’re right on the money with the tone, brevity, and emphasis that “we are in this together.” I smiled while reading the letter you wrote. Thank you for your advice on the guarantee. You’re more experienced in business than I so I consider your advice as a free perk of doing business with you. Not only am I offering a money back guarantee, but an additional 10%. Since I’m just entering the market, I don’t have customer feedback yet; so I really want to eliminate the perceived risk. Within five minutes of sending Mike that email, he gave me his enthusiastic approval to edit the bolded words into a testimonial, which I could then post on my website. Yes, that makes sense. I see now how you get such great, spontaneous comments. I noticed that at the top of your testimonials page you tally up your total number of testimonials. What’s the thinking behind posting that information, if you don’t mind sharing? Here’s how that came about. When I was working with my web designer, Ben Ursal, on my site, he suggested I keep a count of how many testimonials I had. I thought this was too braggadocio, but he showed me other well-respected marketers using that method. So I reluctantly agreed, as you can see at the top of my testimonials page. Other than posting the testimonial on your testimonial page, do you use your clients’ comments anywhere else? Once I’ve got a client testimonial I do milk it for every ounce of marketing power it has. For example, I have three testimonials posted on my Home page, (scroll about halfway down the page). I also incorporate at least one testimonial on each of my Services pages, such as the one for web copy here, (scroll down to bottom of the page). The insanity goes even farther. When Ben created my portfolio section here, he talked me into writing a mini case study for each item. It was a major endeavor, well over 120 case studies. I really don’t know how he talked me into this. The dude is so persuasive. Anyway, included in that case study is a place for me to add a client testimonial regarding the project (again, his brilliant idea, and I mean that with sincerity). You can see an example of a case study with a testimonial here (testimonial is at the bottom of the page) and here (testimonial is at the bottom of the page). Combining the case study with the client’s own comments about the work makes for a compelling package. So that too gives me added incentive to pursue my clients for positive feedback. I jokingly tell Ben that he’s turned me into a crazy person who now cares more about getting compliments than getting paid! The point though is that once you’ve gone to the trouble of obtaining those testimonials, you can get resourceful about ways to repurpose them. They’re likely to be some of the most powerful marketing statements you have about your business. That makes them a great tool for persuading even the most skeptical prospects to do business with you! If a client doesn’t happen to provide any favorable comments via phone or email, do you pursue getting them? The answer is sometimes. It depends on my relationship with the clients. As I’m sure you know, some engagements work out better than others. What I’ve found too, is that some clients don’t feel they should compliment you when they’re paying for your services. They just assume you should do great work because that was why they hired you in the first place. They don’t owe you anything more than the payment. In certain situations, if you know the client is pleased but hasn’t verbalized her satisfaction, you can ask for “feedback,” which sounds a little less presumptuous than a testimonial. Most clients, when prompted, won’t hesitate to give you positive feedback. Can you offer any advice on what elements make a good testimonial? Ideally, the client should describe what problem she had and how you solved it much to her satisfaction. Other would-be clients will be able to relate to the problem. I also like when the client’s enthusiasm is evident in her wording. I want the reader to feel her excitement and get a sense of how truly pleased she is with the work. Finally, I push clients to allow me to use their full name, position and company name. Including those details adds credibility to the testimonial. I know some marketers go even farther by using a photo of the client and even a video testimonial. I haven’t gotten up the courage to ask my clients for those items yet. Maybe some day when I’m feeling bold. Good luck, Elisabeth, getting your testimonials. I’m sure once you see how effective they can be for promoting your business, you won’t hesitate to make them a routine part of your client engagements. Do you need help incorporating testimonials into your website or other marketing materials? Contact Susan Greene today!